SAN LUIS OBISPO, Calif. (Nov. 7, 2018)—Lifewater International launches a brand-new website that personalizes philanthropy, providing real-time updates directly from the field and true stories unique to more than 50 rural villages. Donors will now have insight into the impact of their giving like never before. On the new lifewater.org, those seeking to fund a clean water project can read the story of a family that lives in Ethiopia, Cambodia, or Uganda, see their current water source, and partner with that specific village in bringing clean water, health, and hope. Site visitors can choose a project to support, stay up to date on key project milestones, and interact with Lifewater field staff serving in that village. 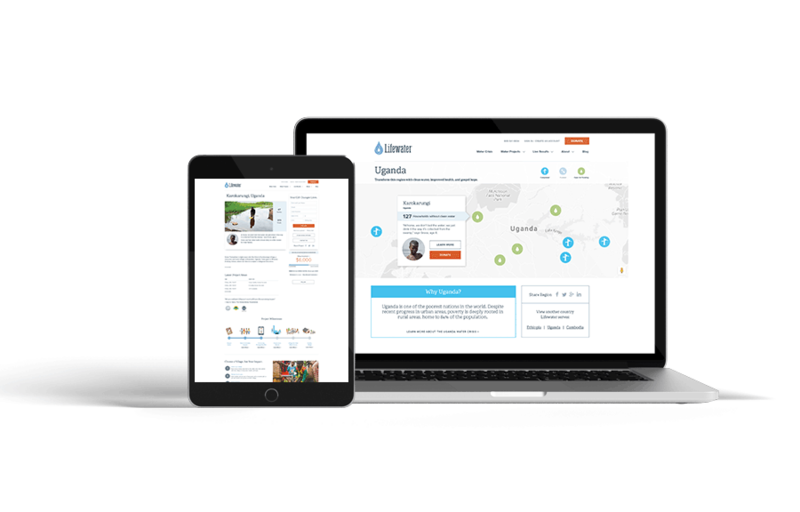 The new lifewater.org includes sharing functionality that allows donors to activate their networks in the cause through social media. For over 40 years, Lifewater has operated through the exceptional generosity of people who donate to a general fund. Lifewater would draw from that fund to implement high-quality, Christ-honoring Water Access, Sanitation, and Hygiene (WASH) projects that serve families experiencing extreme poverty. Previously, reporting back to donors was limited to occasional stories and more formally through an annual report. The only exception to this practice has been for grant makers, who follow a specific project from proposal to report with detailed updates along the way. Just as Lifewater was considering a new way to give, generous donor Brian Rogers, founder of 4K Foundation, was eager to do something big for the Kingdom. Years ago on Stewardship Sunday at his church, Brian was listening to the words of his pastor preach on generosity. It was not long after that Brian sold his business and found himself blessed with the ability to give abundantly and compelled to give in such a way as to leverage multiplying, self-sustaining change. Today, supporters can navigate and give directly to the village of their choosing. They too can experience what Brian calls the “exponential benefits” of giving to others. “Our prayer is that this shift will allow us, together, to serve millions more people, more effectively than ever,” Narducci said.